Disconnected Jottings from Alsace: Watch Out for Hens' Nests! Watch Out for Hens' Nests! Not really a very common road sign, but I did notice one today, which triggered this short post. 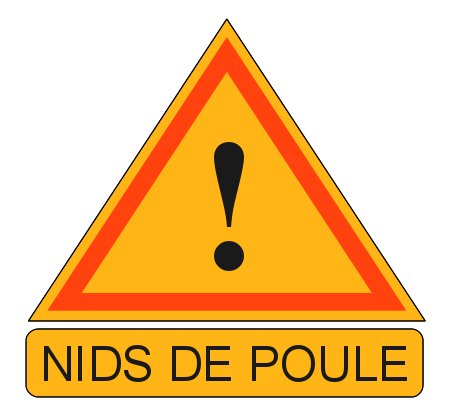 The normal, and graphic, French expression for a pothole in the road is "Nid de Poule" (Hen's Nest). 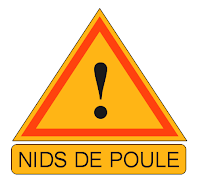 Much more frequent are the warnings "Trous en formation" which always conjure images of holes (trous) in the road in some artistic regular array, like the Red Arrows or La Patrouille de France. The reality is less glamorous - just random potholes. The "en formation" bit doesn't mean "in formation" - just "in process of development".